Bridge 7771 was completed in 1957 as a structurally integrated bridge between the gatehouse and the pump house of the Diversion Works and carries County Road 110 over the Partridge River in St. Louis County. 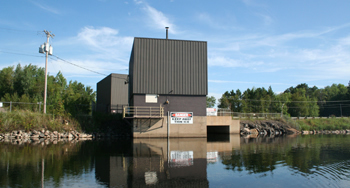 The Diversion Works was designed to maintain the required level of water needed to facilitate the operating of the Erie Mining Company Taconite Concentration Plant. Bridge 7771 is a contributing resource to the determined-eligible Erie Mining Company Diversions Works, which is significant for its role in industry and engineering in Minnesota.